If you've tried the Quick Start guide you've seen a taste of what it's like to use StealJS. 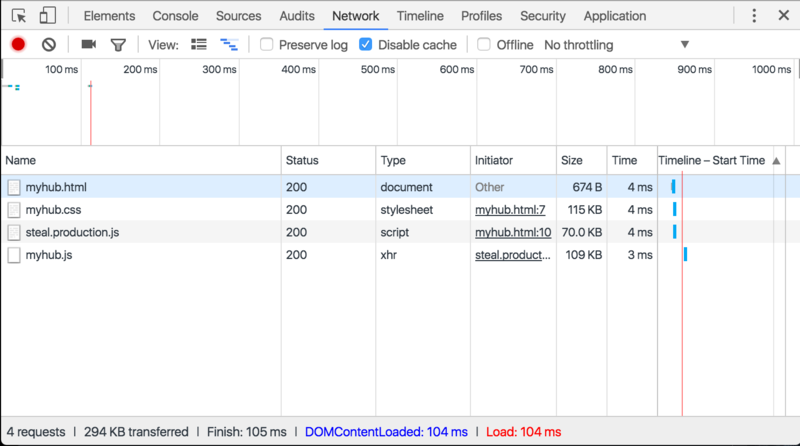 This guide expands upon the quick start guide to give a full example of using Steal's primary feature, progressive loading, to build a single page application that loads only what is necessary. This will be demonstrated by creating a small sample application called myhub. 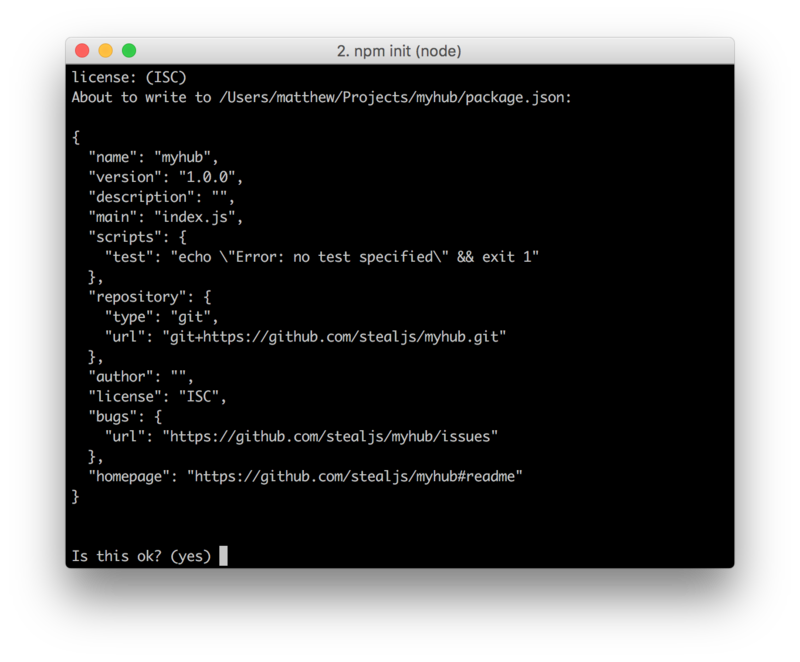 Create a new folder for your project and then run npm init. Answer all questions with their defaults. Open http://127.0.0.1:8080/myhub.html. You should see the Hello world! test. Before proceeding open a new command-line terminal that will be used for additional npm install commands. Installing these 3 dependencies gives us everything we need to build our application. Reload http://127.0.0.1:8080/myhub.html to see your changes. What's an application without a little bit of flare? Steal allows using less through steal-less, which we installed earlier. Each string used to import such as "jquery" and "./myhub.less" are called module identifiers. They identify a module to be imported within the context of the module that is importing them. That means that when you import a module like "./myhub.less" you are importing that module relative to the current module (in this case it is your myhub.js module). Internally Steal resolves all module identifiers into moduleNames, which it uses as the key to look up modules. This allows you to load modules from many different places in the application and have them all resolve to the same module. Steal is able to load npm packages as modules thanks to the npm plugin that comes with Steal by default. If the package uses a module format, all you have to do is import in the .js file(s) where that module needs to be used. Steal encourages the use of modlets as a unit of functionality in your application. and documentation about the modlet. Using modlets helps to ensure that your application is well tested. Update the city variable with your city so the weather page will display your city's weather. Open http://127.0.0.1:8080/weather/weather.html to see the weather widget's demo page. Open http://127.0.0.1:8080/weather/weather-test.html to run the weather tests. Open http://127.0.0.1:8080/myhub.html to see the application using the weather widget. Dependency injection is a technique used to improve testing in your application. Steal provides dependency injection through its module loading system using steal-clone. steal-clone allows you to create a cloned loader with stubs for modules that you want to fake. We'll create a new test and use steal-clone to provide our own fake version of jQuery that will let us simulate a service request, so we can test that the rest of our app behaves correctly. In the case of the test below, the app should list the single forecast it is given. Steal supports all of the most common module formats: ES modules, CommonJS , and AMD . This means your project can contain multiple formats which can be useful if, for example, you are using one module format in your project (like ES modules) but a package you want to depend on expects another module format (like CommonJS). Some libraries on the web are still distributed as globals. Including such a library sets a property on the global window object, instead of exporting a value for use with one of the module formats mentioned above. Steal is able to detect and deal with globals by default, but it's often necessary to add some configuration for correctness. The configuration guide goes into greater depth on how to configure globals in more complex situations, but configuring the globals will be simple for our example. Justified Gallery is a library for displaying a gallery of images. Unfortunately, the library is distributed as a global; so we'll need to add some configuration. Open http://127.0.0.1:8080/puppies/puppies.html to see that requiring justifiedGallery fails. Configuration in Steal is usually done in the package.json, under the steal object. This module is in a global format (format). This module depends on its own style code (justifiedGallery.less). Now that justifiedGallery is installed and configured, we need to require() it in our puppies CommonJS module. Open http://127.0.0.1:8080/puppies/puppies.html to see the puppies widget demo page. Created a modlet for puppies. Configured map and meta in package.json. Required justifiedGallery in the puppies CommonJS module. Getting functionality out of a global script from an npm package and into a modlet is easy as that, thanks to Steal. Now that we've created puppies, the app needs to be updated so that it will toggle between the weather and puppies pages when using the navigation. More specfically, we will do this by looking at the location.hash of the page. There's a lot going on there, so you might want to re-read that file a couple of times to make sure you understand it. When we first installed our initial dependencies for myhub, one of those was steal-tools. steal-tools is a set of tools that helps with bundling assets for production use. To use the production artifacts rather than the development files we need to update our index.html to load them. By using steal.production.js instead of steal.js Steal will know to load the production files we just built. To prevent flash of unstyled content (or FOUC) we can add a link tag to the top of the page. Note that it is usually recommended not to include link tags for stylesheets in the head as it blocks the page from rendering until those styles are fetched. For this small demonstration we'll do it anyways. See PageSpeed Tools for more information. Now if you reload the page you'll notice that only a few resources are downloaded. Steal enables this with bundle configuration. var plugin = typeof moduleOrPlugin === "function" ? In the above code we have a div #main that each page renders into. Based on the location.hash, dynamically import the page being requested. So when the hash is #weather use steal.import to import the weather modlet; if the hash is #puppies use steal.import to import the puppies modlet. Using bundle we can specify each page of our application and steal-tools will build out separate bundles. Using our existing npm run build command we create a build using the default build options. In many cases you might want to customize these, so creating a small script allows you to do that more easily.